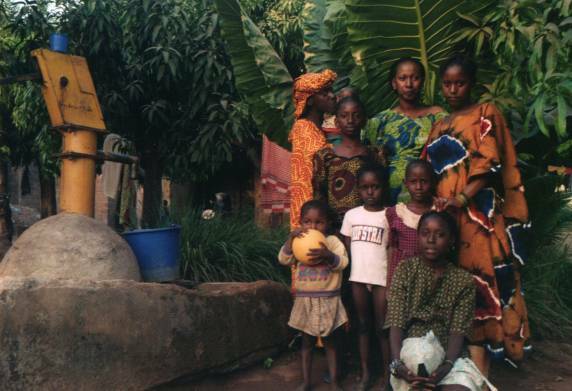 I was asked to take this portrait of a friend's family next to the well pump in the yard, for although it is not for their exclusive use, it testifies to the social position and relative wealth of the family. The plants and trees behind show the abundance and fertility that earns the Sikasso region its distinction "kénédougou": "dougou" land, town; "kéné" fresh, ripe. Bandiagara. In Madani's porch, front to back: Togo, Badjan, Madani and mystery sleeper. 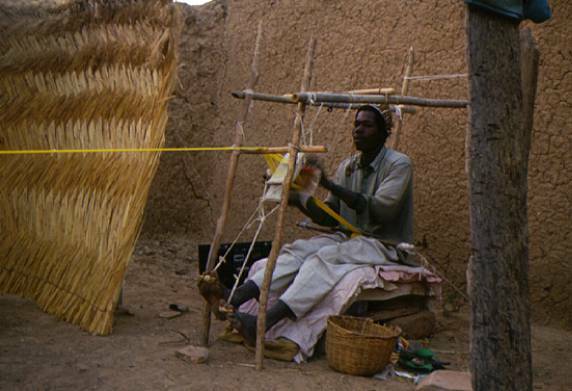 Togo is wearing a Dogon "mud-cloth" suit; made from cotton, and dyed with plants-colour it is the "Dogon denim". Badjan is a long-time friend of Madani's who works for the town water service. Madani sits under a poster of President Alpha Oumar Konaré. Bandiagara. Taking tea, talking and listening to music in our yard. Right to left: Madani, Hawa Cissé, Tijani, a friend I don't know and Korrou. The tape player is powered by an old car battery. Madani is a radio technician, so we had no worries, but I am advised that this may fry any tape player that takes less than twelve batteries. Bandiagara. 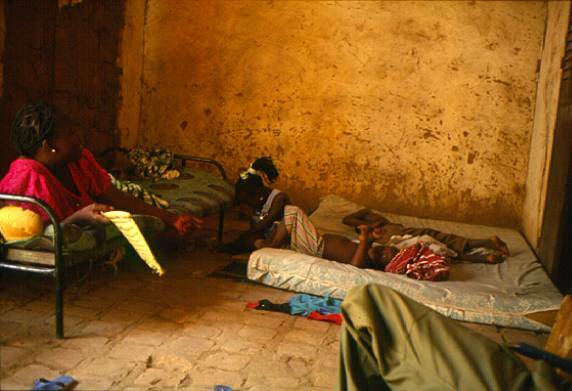 I often visited Fanta N'Daye, her kids, and her husband, Samba, a police officer. She loved to talk, and we had great discussions sitting in her porch or yard, taking tea and watching the eldest son torment his little sister, and her in turn torturing her little brother. Bandiagara. Koda is selling oranges, limes and berries in front of our door. 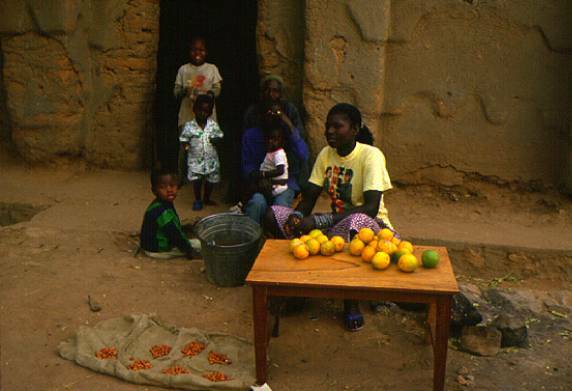 The old man Aba sits behind with two of her children, and another neighbourhood kid. Moctar Tall stands as usual with only one sandal. Mopti, Bathily and Brothers, merchants. Amara Sylla cuts white bazin cloth that I will have sewn into a zarabou for the Rammadan festival. 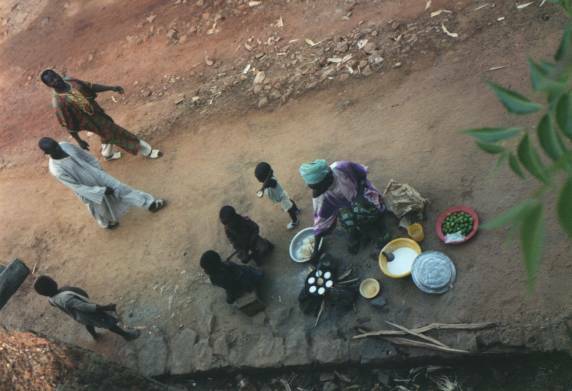 Umo is frying froufrou malo (rice-batter cakes) over an open fire next to the street-side sewer. They are like a small oily pancake with a little sugar cooked in. She will sell these to passersby for breakfast on the go, and give some to the mandiants; students of Qu'ran who beg to feed their teacher and themselves. 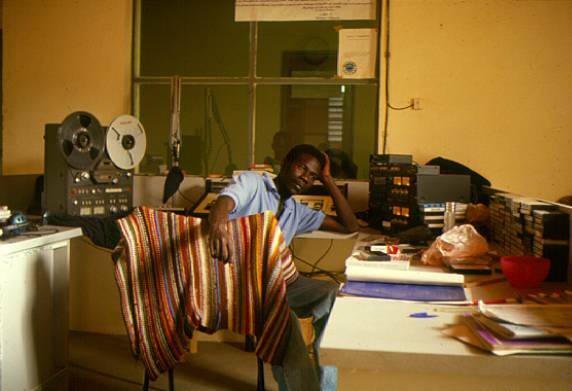 Radio Banguiné Bandiagara. 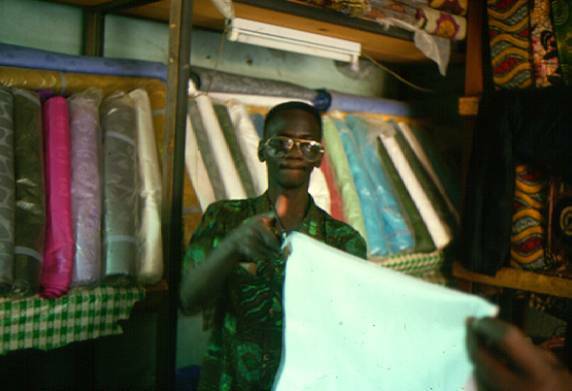 Madani Baba Tall, technician and animateur. My host brother works at this Canadian-built, solar-powered district radio station. 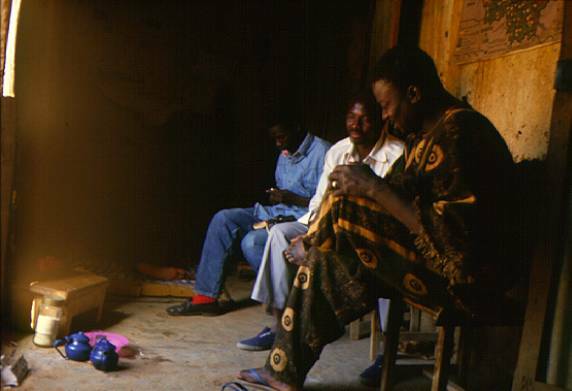 "Banguiné" is Dogon meaning "national (Dogon) heritage". 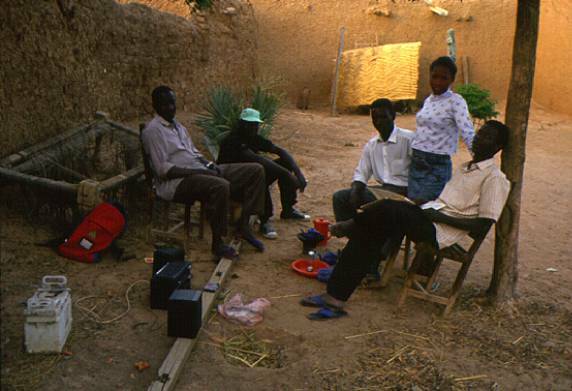 The station broadcasts music, news, educational, cultural, health and community programming in Dogon, Peulh, Bambara, and French. Also here is the blanket my mother knit from scraps, and I gave to Madani for his early morning walk to the station. Bandiagara. Nohma is weaving cotton in our yard. The long strand is fastened to a rock in a bowl of sand, heavy enough to keep the tension, but light enough to be dragged, inching across the yard during the work.